Saint's Preserved Body Caught on Cam Blinking It's Eyes! In a Roman Catholic belief, Catholics saints are men and women who lived holy lives in obedience to God’s will, and they became saints at the moment they entered heaven. The process for being acknowledged as a saint is ancient, traditional, and often mysterious. Evidence must be presented to convince Church officials that the person in question in fact lived a virtuous life, had faith, and had the support and help of God. The Church also looks at miracles as confirmation that God is working through that person. 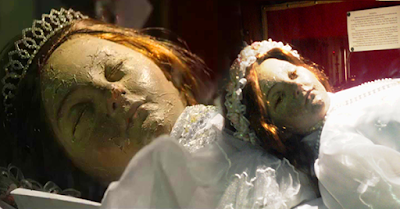 In Guadalajara, Mexico, there was an occurrence that a Mexican saint named lSanta Inocencia who happens to have lived many years ago, but now preserved and kept in Guadalajara Cathedral, opened her eyes while being filmed. The people in Mexico were terrified and shocked after the opening of the eyes of the preserved saint. In the short video, you can see how the little saint opened her eyes. No one guaranteed if that incident is real or just manipulated. Maybe a video expert can tell if there’s something suspicious behind this short film. It is true that miracles do happen even to this day, but we should always bear in mind that the devil can do counterfeit miracles to deceive many people which eventually turn them away from the truth of the Word of God. It’s better that we subject this kind of thing to careful study.